Founder of DiscoveryWorks Ltd., Harry DeBari, has praised the Vincentian staff for being some of the best workers he has ever employed. The successful entrepreneur noted that DiscoveryWorks does document processing for some of the largest pharmaceutical and insurance companies in the US and said that this generated some US$200,000 per month. 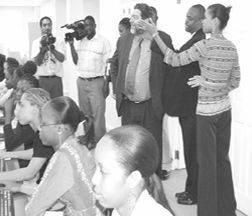 DeBari said that he first realized the good work attitude of Vincentians back in 1996 when DiscoveryWorks was called Net Data but was saddened when the company was sold. The businessman said that he made a promise to purchase the company back and did so in 2005 by investing $1 million into the refurbished facility. DeBari announced that with just 300 committed employees working on day and evening shifts, DiscoveryWorks processes some 20 million electronic files per year. The CEO said that this was an indication that once Vincentinas are provided with opportunities, promotions, financial incentives and a clean working environment they will perform. DeBari wrapped up the tour of his two story facility by also praising the government, particularly Minister of Telecommunications Dr Jerrol Thompson for always giving assistance to his company and announced plans to expand using a night shift. Dr Gonsalves thanked DeBari for the tour and commended him for not just engaging in simple computer key boarding, but for also training his staff in the high tech areas of IT. The Prime Minister noted that when he first established the Ministry of Telecommunications, Science and Technology he was harshly criticized but felt validated when DeBari pointed out the importance that this ministry played in enhancing IT companies. Dr Gonsalves also pointed out that to improve the communication system in the various government sectors, the old PBX system was being replaced with underground fiber optic cable and called on the public to be patient with the excavation work on the sidewalks in town for the installation of the cable.